20 red roses in Cellophane+Fruit Cake+10 Cadbury Milk chocolate --- wt 12 gms per chocolate. Delight your occasion with this delicious and elegant burst combo. 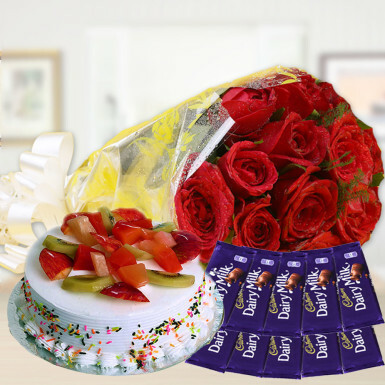 Cheer your special one with this amazing gift hamper containing a bouquet of 20 red roses, a toothsome fruit cake and 10 Cadbury Milk chocolate. The taste of fruitcake will quench the thirst of sweetness. You can order this gift hamper on occasions like birthday, anniversary, valentine’s day, mother’s day, propose day and many more. Bouquet of red roses will definitely add the color of love in your relationship. So, order now and make your bond stronger.